Unlicensed Contractors May be Subject to a Misdemeanor or a Felony. Any person who practices, offers to practice, or holds themselves out as licensed to practice contracting is subject to criminal prosecution pursuant to section 489.127, Fla. Stat. The first offense is a first degree misdemeanor under section 775.082, Fla. Stat. Further offenses are third degree felonies under 775.083, Fla. Stat. Moreover, any offense committed during a Gubernatorial declared state of emergency is a third degree felony under section 775.083, Fla. Stat. Unlicensed Contractors Have No Lien Rights. Pursuant to section 713.02(7), Fla. Stat., “notwithstanding any other provision of this part, no lien shall exist in favor of any contractor, subcontractor, or sub-subcontractor who is unlicensed…” Additionally, an unlicensed contractor also loses their bond claim. Unlicensed Contractors’ Contracts are Unenforceable. Pursuant to section 489.128, Fla. Stat., contracts entered into by an unlicensed contractor shall be unenforceable in law or in equity by the unlicensed contractor. However, in Brock v. Garner Window & Door Sales, Inc., 41 Fla. L. Weekly 571 (2016), the Fifth District Court of Appeal held that unlicensed contractors may raise the statute of limitations applicable to the construction contract as a shield. Accordingly, while unlicensed contractors are unable to enforce their contractual rights, they are able to assert the statute of limitations as a defense. Unlicensed Contractors May Be Subject to Administrative Penalties. Pursuant to section 489.13, Fla. Stat., any person who practices, offers to practice, or holds themselves out as licensed to practice contracting is subject to civil penalties up to $10,000. Unlicensed Contractors May be Subject to Treble Damages. Section 768.0425, Fla. Stat., provides that a consumer harmed by an unlicensed contractor is entitled to treble damages, which means triple the amount of the actual/compensatory damages, and attorney’s fees. Unlicensed Contractors May be Faced with Disgorgement of Fees. There is the potential that the unlicensed contractor is forced to repay the monies that were paid to them. The support for this theory derives from case law regarding other unlicensed professionals. See Cooper v. Paris, 413 So2d 772 (Fla.1st DCA 1982); Vista Designs, Inc. v. Silverman, 774 So. 2d 884 (Fla. 4th DCA 2001). Unlicensed Contractors are Subject to FDUTPA. The Florida Deceptive and Unfair Trade Practices Act, Ch. 501, Fla. Stat. was implemented to provide consumers with stronger legal protection. Unlicensed contractors can be faced with penalties for violations of the FDUTPA, ranging from the imposition of personal liability to providing for prevailing party attorney’ fees. As one can see, the penalties for unlicensed contracting in Florida are severe. 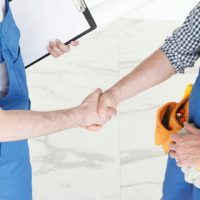 Parties that are victims of unlicensed contracting should consult legal counsel to ensure that they are enforcing all of their legal remedies. Anyone faced with allegations of unlicensed contracting should consult an attorney immediately due to the gravity of the penalties. Sweeney Law, P.A. is well equipped to assist clients in any issue regarding unlicensed contracting in Florida. Brendan A. Sweeney, Esq., of Sweeney Law, P.A., has litigated complex Florida construction law issues throughout Florida. Brendan A. Sweeney, Esq., is an AV Preeminent Martindale Rated Attorney, that has been recognized as a Florida Legal Elite Rising Star Attorney in 2014, 2015, 2016, 2017, and 2018. If you have any Florida commercial leasing questions and/or issues then contact Sweeney Law, P.A. at (954) 440-3993 immediately to protect your rights. www.sweeneylawpa.com.